My shower baskets were showing signs of rust, so it was time for replacement, and this caddy system looked interesting. 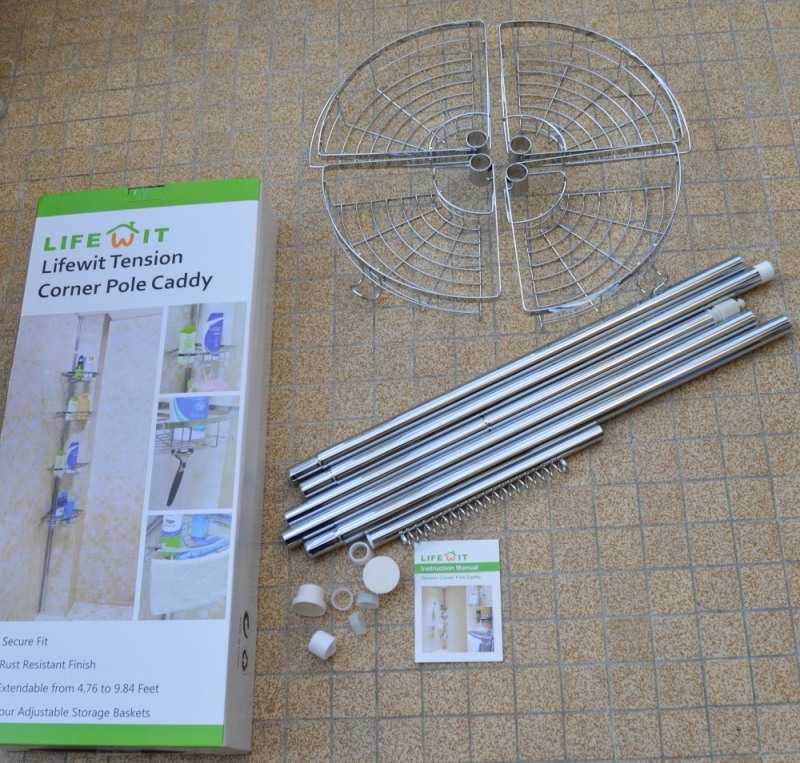 The product arrives in pieces and assembly is quite simple, if one follows the instructions carefully. If you take the time to identify the various components, the mounting steps make sense and are easy to follow. 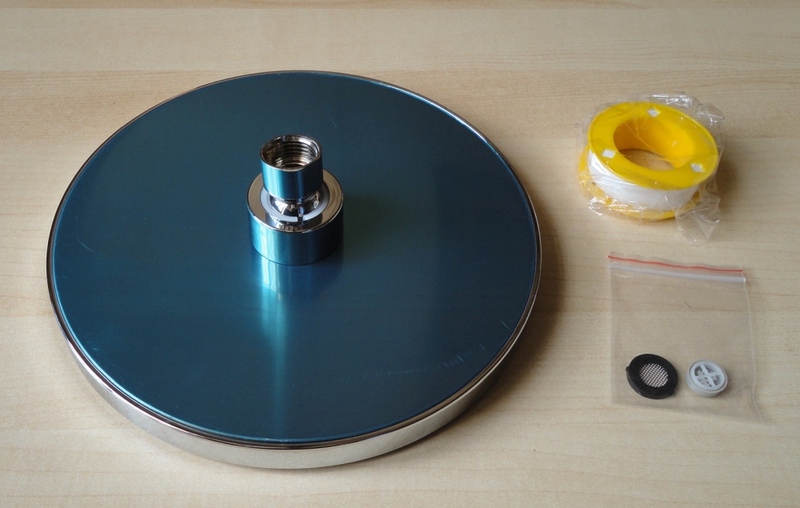 Basically it's a series of five metal tubes plus a shorter one, which (together with a strong inner spring) allows for height adjustment. One of the longer tubes is optional, depending on the height of your bathroom ceiling. The four baskets are then threaded through as each section is connected to the rest. 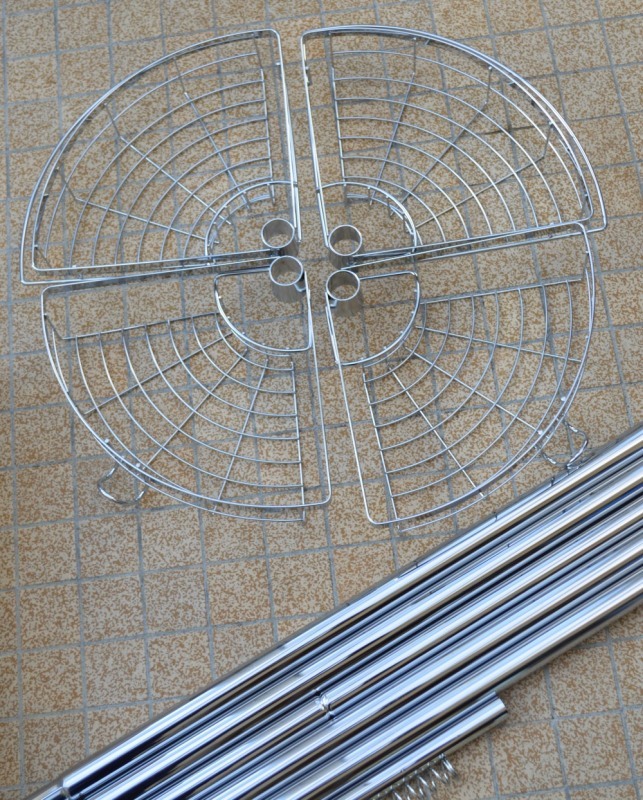 It's best to measure carefully and decide whether the extra tube is needed or not; also the position of the baskets, although adjustable later, is much easier to do ahead of time. In our case, the fit worked better without the extra tube. Just make sure you lock the last section (with the spring) strongly enough to keep the whole tube solidly in place. This is accomplished by twisting one tube against the other by hand in a clockwise direction. The four baskets seem sturdy and take an amazing amount of toiletries – easily three times as much as our previous two baskets. 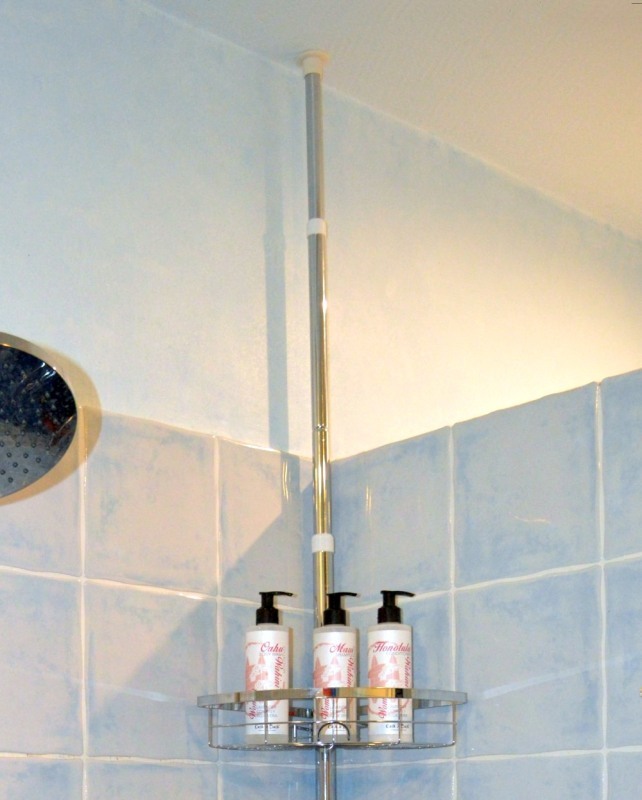 The finished column looks terrific and very sleek in our shower. The model I received has closed hooks in front of two of the baskets; I much prefer this design to the open hooks in the Amazon photos. No chance of getting snagged or scratched with the smooth profile. 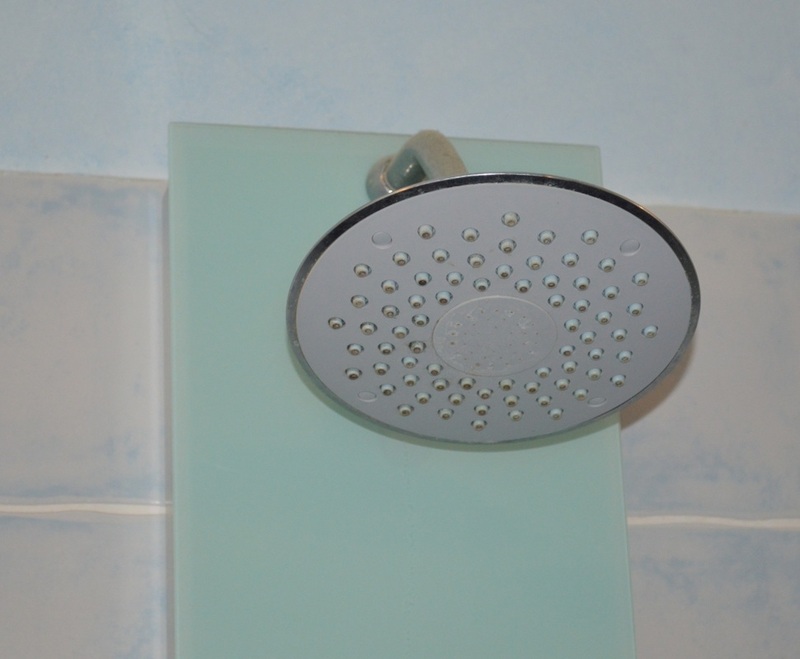 The finish is described as rust resistant and, so far, it is standing up to shower spray without any problems. Very pleased with the appearance and functionality, and the corner placement takes minimal space. In our shower cubicle, this storage system works great. 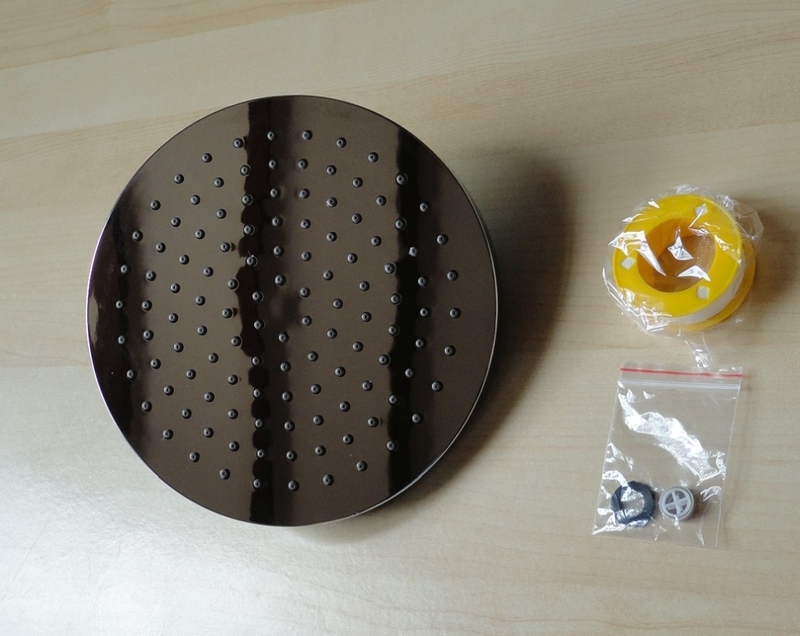 The original shower head that came with our colonne split in two a couple of years ago, and we had to look far and wide to find a suitable replacement. 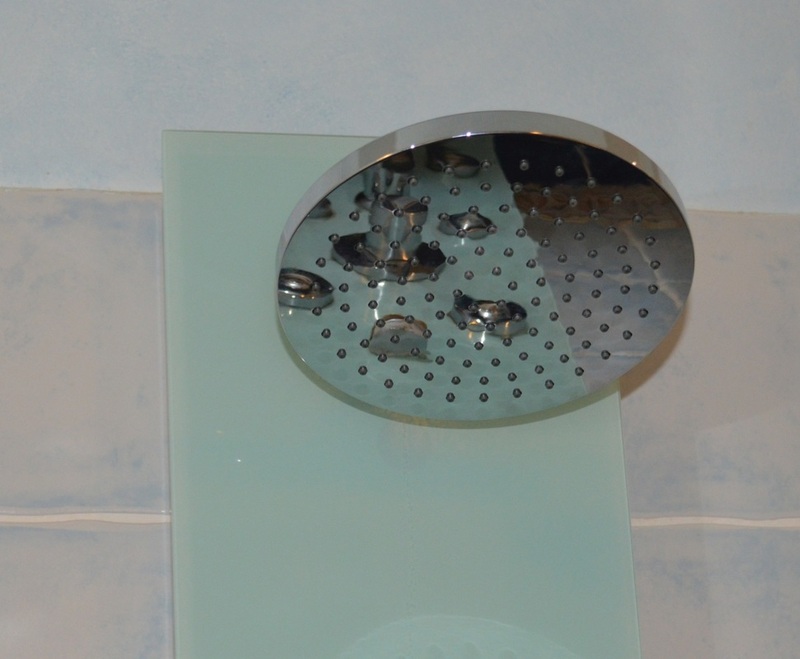 We ended up buying a very expensive 20 cm rain shower head that does the job but is really the wrong look for our bathroom. It works (although the water flow is a bit too soft for my liking), has the anti-calcaire tips and an optional central jet (which we never use) but I can't stand the grey plastic underbelly (shown in the last of my photos). 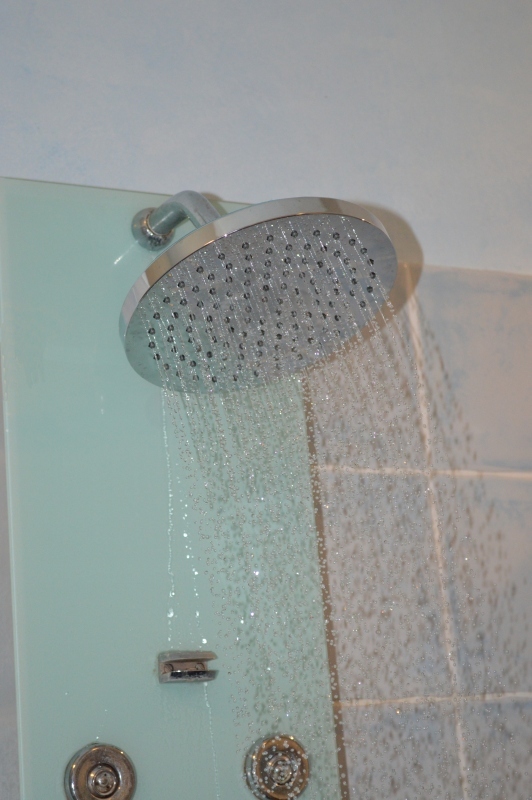 This shower head from Favinus is the same size as our existing one but somehow the experience is so much nicer. Installation was a simple matter of unscrewing the joint of the old one and screwing on the new one. In the box there is a roll of tape and a flow restrictor, if your water supply is very strong. We didn't need either, but we did push into place the little filter as our water is medium-hard. The stainless steel look is a perfect match for the other metal elements in our bathroom; it's identical to the original, only twice as large. The pivoting action is not huge but more than sufficient for our requirements. However, looks, aside, what I really love is the strong, wide flow of water that comes out. Some rain heads make the water fall too softly and the bigger the diameter, the wimpier the flow. This one is very wide but the flow is quite generous and very luxurious. Even rinsing my long hair takes a fraction of the time that it used to. I am absolutely delighted with it. I love this bathroom mat. 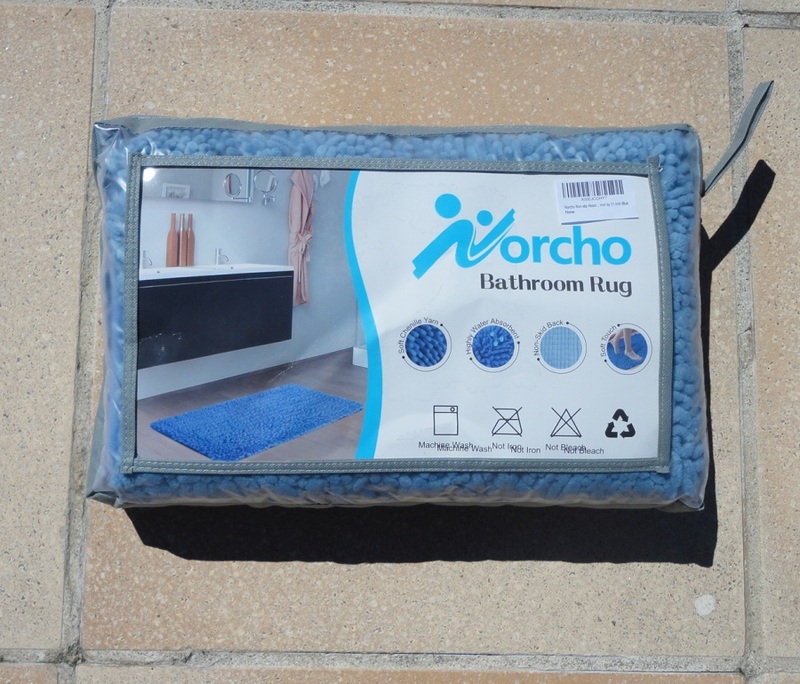 The texture is super soft and cushions our steps over the hard tiles of our floor, the colour is pretty and goes well with the other blues in our bathroom, it's a good size (50 x 80 cm), not too large, not too small, just perfect for stepping out of the shower and reaching for a bathrobe, while the deep loops basically dry your feet. For me the outstanding feature is the fact that it dries so quickly. 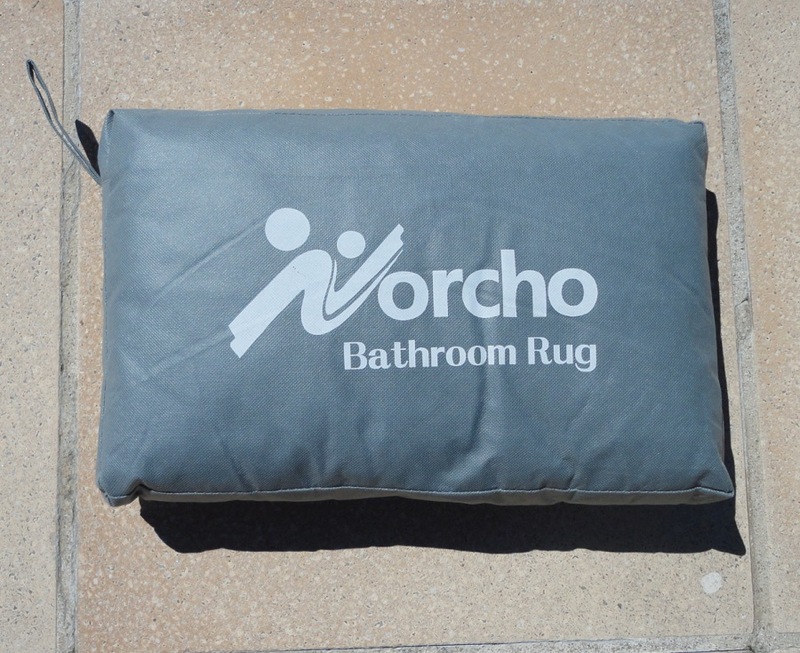 We have several bathroom mats, including a set by Tommy Hilfiger, which look lovely but invariably once wet, they need to be hung outside to dry. With this mat there is no need. 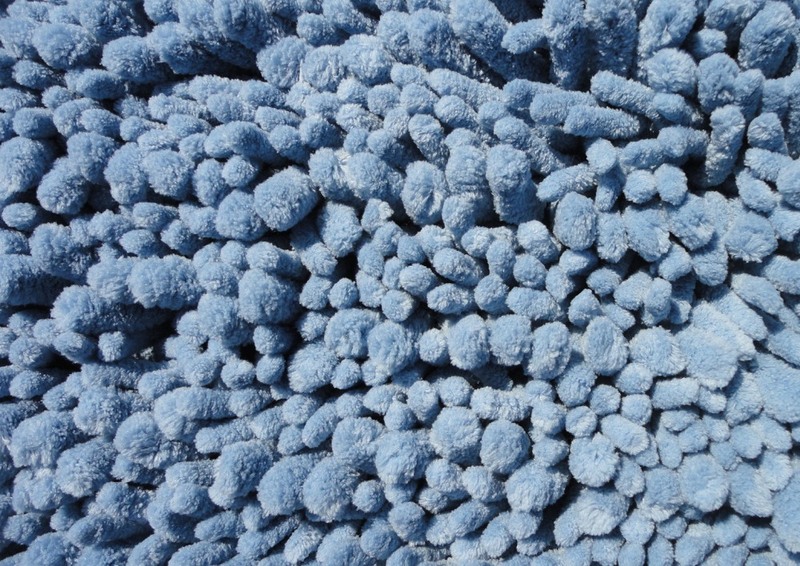 The microfibre loops dry quickly on the spot and stay looking pretty fluffy even when stepped on. 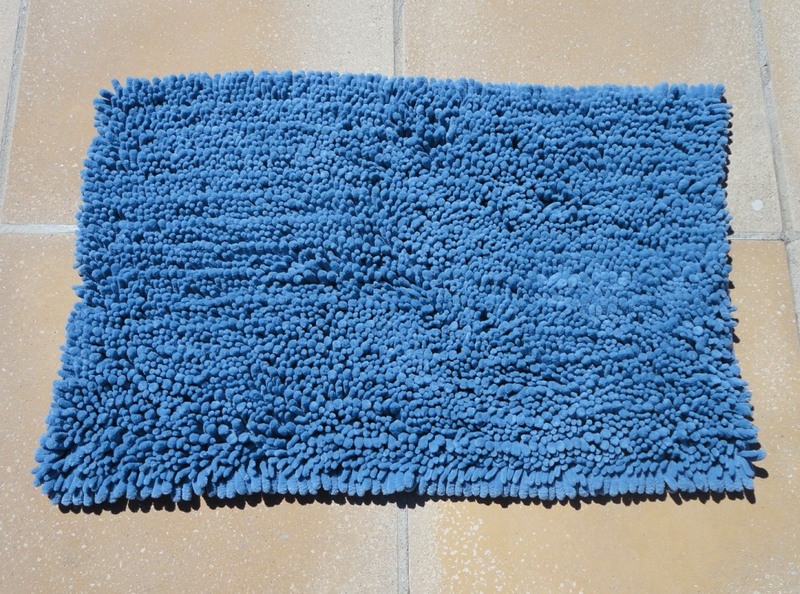 It washes well, but I have learnt to do a separate load for microfibre items, including this mat. Gentle cycle, low heat, less detergent than you would think and no mixing with natural fibres like cotton which produce lint and clog up microfibre. The thing with microfibre is to try and keep the air spaces open. 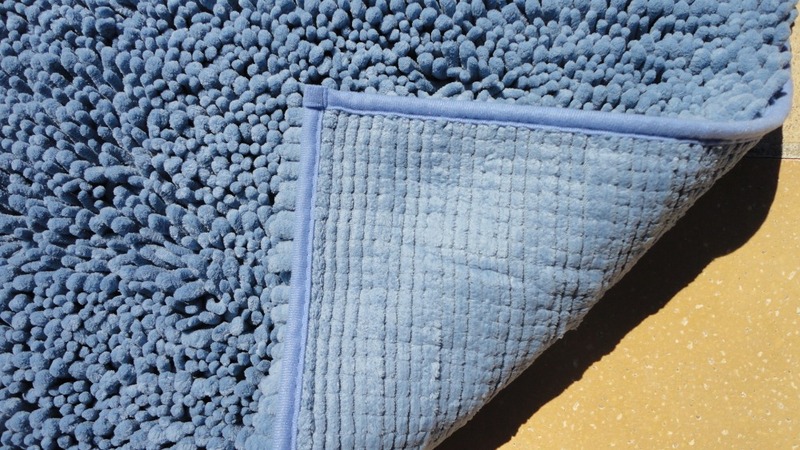 The mat dries quickly in the fresh air and does not retain odours. I also love the backing; it does not slip but is not covered in rubber which usually starts to break up after a few washes. My new favourite.